If you like cooking you should have a basic idea of spice. A basic idea of the different kinds available, how to use them for delicious meals and a clue of the positive effects they have on your health. 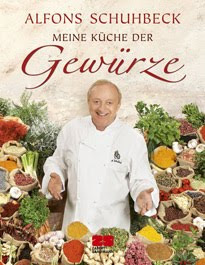 All this information is provided by the well-known cook Alfons Schuhbeck in a great manner. In the first part of the book a lot of spicery are described in detail, in the second part you will find instructions for preparing your own tasty spice mixtures and last but not least the book comes with fine recipes where the spicery described before can be used.